Sessions keep popping up all over the place. So dust that instrument off and get out and play. 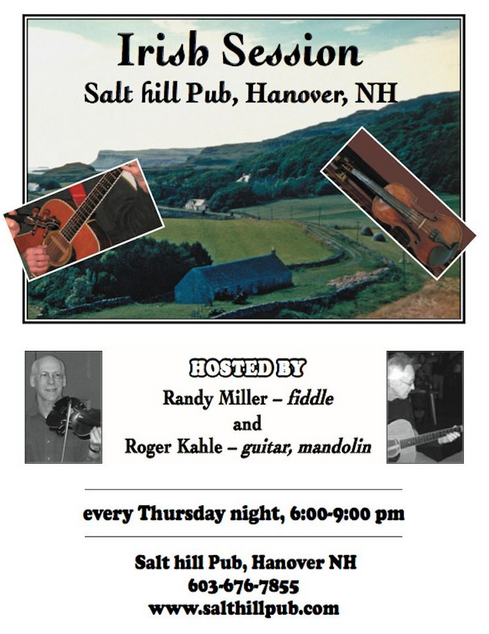 Starting this week fiddler Randy Miller and guitarist Roger Kahle will host a weekly session at Salt Hill Pub in Hanover, NH. The session is from 6-9pm. I hope to see you there one of these days. Hope you’ll stop by. The Touhy brothers, Josh and Joe, owners of the 3 Salt Hill Pubs (Lebanon, Hanover, Newport) are big supporters of Irish traditional music and have helped turn the CT River Valley into a musical hotbed. They deserve our support! !